Say G'day Saturday Linky Party ~ Turning 40! Hello my dear friends! Welcome to this week's Say G'Day Saturday Linky Party! Have you had a great week this week? I have had a lovely week and one day in particular was very exciting! First I have to tell you that I had a Shellac French Manicure...I love shellac and am totally addicted to it. It's my new favourite thing! Thank you for making this yummy Peanut Butter & Chocolate cake for me, Stacey! Yes indeed...I have truly had a life changing weekend! I have had such a great birthday and I will be celebrating with all of my family tonight at my favourite Thai restaurant so I hope you don't mind that that this post is a bit brief...you only turn 40 once! Thank you for the peonies Mr Attorney! If you would like to share some of your favourite post with me at this weekend's Say G'day Saturday Linky Party please link up! You can link up an old or new post about anything you feel excited about! You can share a tutorial, recipe, decorating idea or even a gardening tip! Just link up the particular blog post that you would like us to visit to the Linky tool below. By the way, if you haven't already heard, I have created a central list of Pinning Bloggers so we can all find each other's Pinterest pages more easily called The Pinning Bloggers Master List. 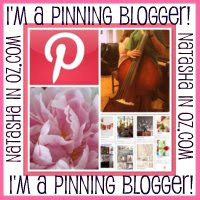 If you would like to add your name to the Pinning Blogger's Master List just click the button! Thank you so much for visiting today. Please know that I truly appreciate you taking time out of your busy day to spend time with me in my little corner of the world Down Under! Your cake looks delicious!! 40 is pretty fabulous!! Happy 40th - now your life BEGINS! Great nails, great cake - enjoy. Happy Pink Saturday! Happy Birthday Natasha! The cake looks delicious! Happy Birthday. It looks like you're already to party! Happy Birthday Natasha! Your birthday is a special day! Lovely flowers! Thanks for hosting. I will be back with some pins this weekend. Wow, happy birthday! That cake looked to die for. Yummy. Hope you have a special night out! Thanks so much for your kind comment over at my blog. I just linked up to the pinterest party. Sound like your have an amazing 40th birthday. Happy Birthday to you. Happy 40th Birthday! I don't have a pinterest post on my blog this week, but this sounds like fun, so I'll be back! Happy 40th Birthday! I'm so glad to hear you have been busy pampering yourself, and hope you thoroughly enjoy your family party tonight! What a great party !! an a great cake !!! ...congratulations darling.....love love love....xxxxxxxxxxxxxxxxxxxxxxxxxxxxxxxxxxxxxxxx..........for each year one !! Hi Natasha. Hope you had a great birthday week. Sorry I'm a bit late Natasha, but wishing you a belated 40th birthday. I hope that this coming year will hold lots of wonderful happenings for you. The big birthdays are always very special, aren't they?! I'm glad you had some pampering done - wonderful! You're still a mere spring chicken, don't forget. Things just keep getting better and better my friend. Hugs. Happy Birthday!! That cake looks amazing... and huge! Happy Birthday, Natasha! I hope you had a wonderful day. God bless! Would you mind visiting my PINK please? Thanks! Happy 40th birthday! Your nail look great. Sounds like you had a lovely time. Happy birthday - and wow that cake is awesome! Great party! Happy 40th Birthday!! Sounds like you treated yourself this week too! Good on you!!! Happy 40th. I have often wondered about Shelac manincures... am putting one on my list of thing to do this week. Have a great weekend. OMG - I want to dive head first into that cake! Happy 40th Natasha! Congratulations & Happy Birthday on reaching the big '40' Love the shellac manicure - I have been meaning to try it out - I look down at my fingernails & think I really need one desperately. The cake looks yummy & the peonies are gorgeous! Happy birthday! Sounds like it was wonderful!! Happy Birthday to you! I see, everybody made nice efforts to please you. I think, it was a great party. 40 & Fabulous, Happy birthday Natasha!!! I can't link up again, say's i need a link back to your blog, but i do have one!! Happy Birthday, dear Natasha. I am so glad you have been enjoying your birthday celebration. I know you will make "forty" proud. Happy Birthday and Best Wishes!! Happy 40th birthday!! I've joined Pinterest but still learning about it as I've been short on time to explore! Have a wonderful week. Happy Birthday. I'm drooling over that cake. Hi Sweetie Pooh and Happy Birthday! That's the cutest cake too! You're just a baby! :) I could certainly be your mother. Not only does life begin at 40 but the fun!!! Happy Birthday and I really need to to a post again to link up!!! Your kind comments and awesome link party inspired me to get myself in gear and link up! Thank you! Hi Natasha, great party! I'm so happy to be sharing a song, video and musician that I adore! I linked-up a song from Matt the Electrician. Matt, as well as his wife Kathie, and I went to high school together. I love his voice and his charming lyrics. The whole album is fabulous, really! Matt's wife Kathie is a talented artist and was responsible for all the whimsical backdrops in the video. Enjoy! Just joining in, a bit late, but at least I made it : ) to your party! Happy bday to you! Looks like you had a great day!!! Peanut butter and Chocolate Cake!! I want one. Happy Birthday. Thank you for linking up to More the Merrier Mondays. Happy Birthday!!! 40 is the new 30 so enjoy every minute!!! mmm...that cake! Happy Birthday! So, what's this shelac french manicure? Thanks for linking up! Happy Birthday! Hope you had a great birthday!! and as they say, live begins at 40!! Happy Birthday to you, and 40 is a great age. Sure wish I was 40 again, no I am not telling how old I am. I'd love to have that cosmo right about now. I love them, did you finish the cake yourself? Thanks for sharing at Sunday's Best. I am so sorry that I am calling by so late to wish you a very Happy 40th Birthday, a milestone indeed, almost a grown up. :) As you know I have been absent from blogging due to the Olive Harvest so only just now catching up with all my favourite blogs. Free E-Zine for Christmas and an Announcement! A Day of Remembrance ~ Lest We Forget.